The Bhat are known for 'phakra' (speaking poetically in praise of others). The Bhats are an offshoot of Brahmins, as their name is merely a corruption of the term Brahman. They are mainly a landowning community. They work in temples as priests who sometimes read the Bhagat and Puranas. They worship Tusu and Bhadu and local deities such as Kudra. The Bhat shun manual work. Literacy is very low among the Bhat, particularly among women. 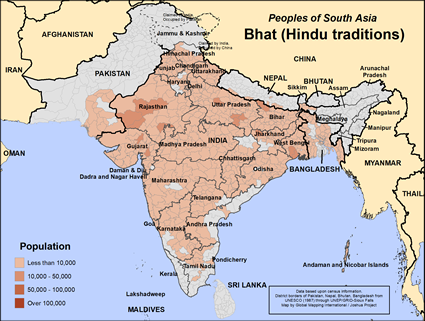 The Bhat community speaks over 40 languages. Evangelistic and church planting efforts need to accommodate these language subdivisions. The low literacy rate suggests the need for oral communication of the Gospel message. Christian workers can carry the good news of Jesus to the Bhat community using Gospel films and recordings in the various languages spoken by the community. 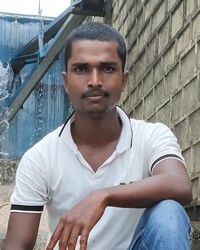 There may be no followers of Christ today among the Hindu Bhat, but pray for those the Lord will soon call to himself. Pray they will live a life worthy of their calling in Christ. Pray also for the availability of resources such as Scripture and Gospel recordings. Pray that a strong movement to Jesus will bring whole Bhat families and clans into a rich experience of God's blessings. Pray each individual in the Bhat community who is capable of making a decision about Christ will be given at least one opportunity to do so. Pray the message will be in the mother tongue of the individual, and will be clearly presented. View Bhat (Hindu traditions) in all countries.